Managing funds is no easy task. The responsibility of protecting others’ money entrusted to us is not something we take lightly. Steve and I try to put on a calm, confident face at all times, but it is not always that way on the inside. There, I said it. I let a little secret out. We know our investors have not hired us to tell them all the problems we deal with on the backside. They rightly expect us to worry about all the details while they simply collect their returns. As fund managers, we are the ones who should be waking up in the middle of the night with cold sweats, not our investors! And you know what? I am good with that. In fact, I thrive on it. 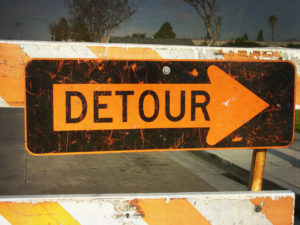 Being a fund manager means encountering unexpected detours. The upside? It challenges us to think smarter. At this point, Steve and I have gotten really good at strategizing our way through those unexpected currents, but the truth is, not everything works out the way we’d like it to. In our non-performing notes fund, Assuravest, we are continuing to encounter a challenge: a large portion of the portfolio’s money has not been deployed for a little more than a year. How could something like this happen? My simple answer is that it happens day-by-day, or maybe it’s more accurate to say month-by-month. However, it doesn’t stop there. After you purchase the notes, you need to move them to a new boarding company, put them into your servicer’s system, and —this is the biggest part — collect the collateral for each of the notes. The collateral can take from 3 months to a year to collect, and you can’t start working the note until you have it. It sounds silly, doesn’t it, to have to wait so long to collect money on or “work” something you purchased? That’s how it is with notes. And when you think about it, something like a real estate development could be years in the making before you get paid anything on the investment. Now that you have a little more background on the non-performing notes business, it might makes more sense when I say that we are having one of those “everything-didn’t-go-as-planned” events. For over a year, we’ve been in an ongoing purchase trying to get about 40% of our portfolio deployed. We have been promised almost every month since February (that’s what I meant by “month-by-month”) that the purchase was going to go through the following month, so we’ve waited. Up until now, waiting has seemed like the right thing to do: The purchase is supposed to be worth the wait, the notes all have their collateral, and we are getting a great price. What’s the holdup? When we purchase tapes of notes, we are almost always part of a bigger purchase through a hedge fund. Our $1.15M is a small part of a very large purchase which in this case is coming out of a bank. The bank’s legal department seems to be holding up releasing the notes for some reason. I told you this business was messy! So, this has put us in a real pickle. Do we keep waiting and hope that next month the notes will be released like we have heard so many times before? Do we get our money back and try to find another buy? (This would be a challenge because there aren’t as many of these types of notes to choose from as there were two years ago when we purchased them.) Do we get the money back and just return it to our investors, less the opportunity cost that we have lost on the earnings for that money? Obviously, nothing is black or white, because each scenario has some sort of an unknown outcome. Even getting the money back and distributing it to the investors is an unknown since it could still be the best tape of our lifetime, and walking away could be a costly opportunity loss. Now do you see why we wake up in the middle of the night? We were relaying this story to a trusted note buyer and fund manager at the recent Note Expo in Dallas. He went on to tell us his horror story of waiting 4 years for a tape. I don’t know if I could go that many eyes-wide-open nights! It is not always as perfect at Hughes Capital as we wish it could be — and I am sure our investors wish it even more — but we have no choice other than to live in the real world and meet these less-than-ideal circumstances head-on. We know that everything we do is scrutinized, and it should be. What you can always count on from us is transparent, real information (not just the “feel good” stuff), direct communication with our investors in keeping them in the loop of positive or not-so-positive developments, and the assurance that we’re working on a solution for every challenge that will result in the best possible outcome.